The Horsehead Nebula (Barnard 33) is an iconic dark nebula in the constellation Orion. Along with the nearby Flame Nebula (NGC 2024), this region is one of my absolute favorite deep sky targets to shoot with my DSLR camera and telescope. The Horsehead Nebula is part of the much larger Orion Molecular Cloud Complex. Compared to some nebulae, this one is very easy to find. It is located near the most eastern star in Orion’s Belt, Alnitak. From the Northern Hemisphere, this is a winter deep-sky object that best photographed between the months of November – February. From a light polluted backyard in the city, capturing a nebula like the Horsehead Nebula requires patience and perseverance. The use of narrowband filters can dramatically improve your results. 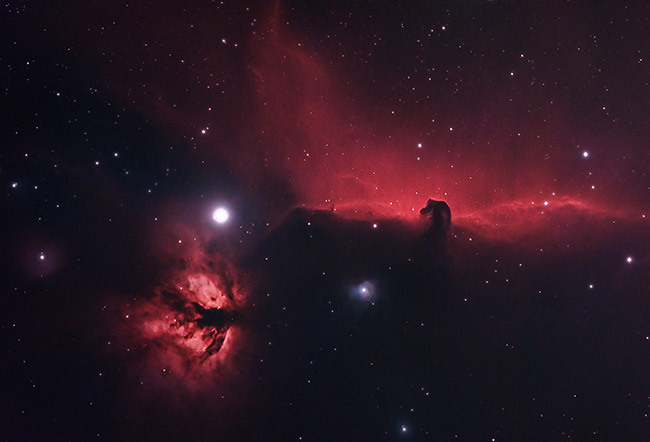 The Horsehead Nebula lives approximately 1,500 light years away from Earth. This nebula gets its name from the shape of the dark cloud of dust in front of a vibrant red emission nebula (IC 434). It is one of the most photographed and identifiable nebulae in the night sky. The reflection nebula residing southwest of the Horsehead is cataloged as NGC 2023. There are even more fascinating deep sky objects in this region of space including IC 432, as seen in this annotated image. The pinkish glow in my image is due to the hydrogen gas lying behind the Horsehead Nebula, which has been ionized by the bright star Sigma Orionis. The streaky appearance of the hydrogen gas in the background glow is created by Magnetic fields. The intense glowing strip of hydrogen gas that the Horsehead crosses over is my favorite feature of this deep sky object. The darkness of the Horsehead Nebula’s figure is created by thick interstellar dust blocking the light of the gas and stars behind it. 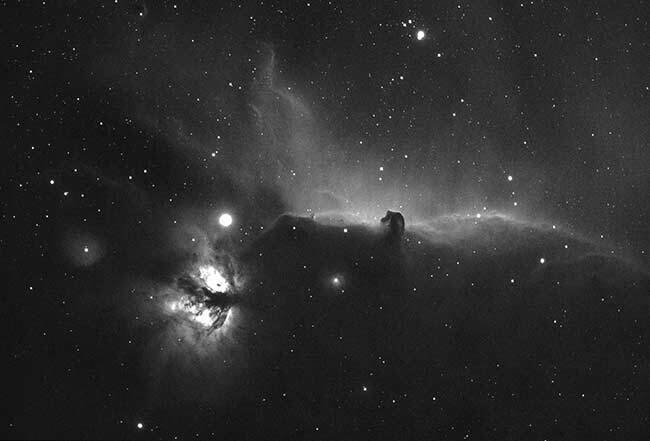 It is interesting to note that the lower portion of the Horsehead’s neck is casting a shadow to the left. I think it’s incredible to observe and study these features in an image taken with an entry-level astrophotography camera. 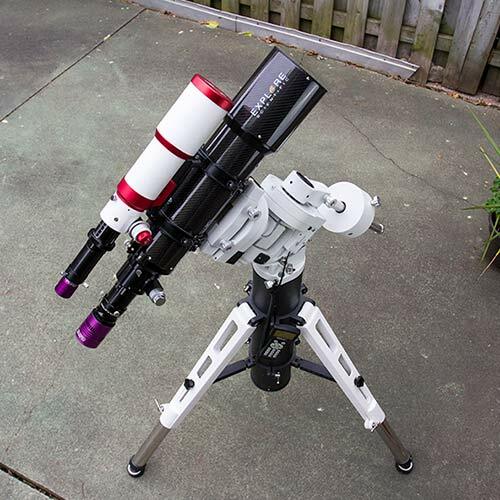 A wide field apochromatic (APO) refractor is a superb instrument to use when capturing Barnard 33 with a DSLR camera. Due to the wide field of view of the Explore Scientific ED 102 CF, I was able to frame the image to include the Flame Nebula. This is a popular orientation for images of the Horsehead Nebula in Orion. In late November 2016, I took advantage of some late fall clear skies in the backyard and collected as many RGB exposures as possible. I set my modified Canon Rebel T3i to take 3.5-minute exposures through a Hutech IDAS LPS filter. After collecting full-color exposures on this target using a broadband light pollution filter, I began collecting subs with a narrowband clip-in Ha filter. The narrowband Hydrogen Alpha exposures ignore almost all wavelengths of artificial light and produce a detailed monochrome portrait of the area. 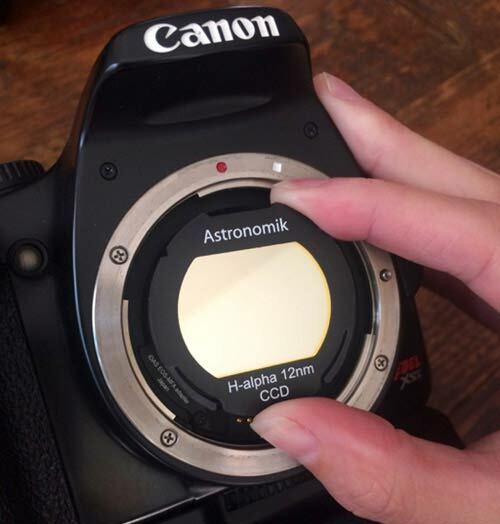 The filter I use with my Canon Rebel T3i is an Astronomik 12nm Ha clip-in filter. A filter like this is a great way to add impressive narrowband details to your existing color photos, and even shoot during a full moon. I absolutely love the way this filter isolates hydrogen gas in emission nebula targets. It also captures very small, sharp stars in a way that a broadband filter never could. As an added benefit, clip-in filters like this can be used with a camera lens as well. To create the image below, I captured several 4-minute exposures totaling 1 hour and 20 minutes of overall exposure time. After stacking the Ha exposures in DeepSkyStacker, I combined the final version with the RGB data to create a HaRGB Composite. This method can produce incredible portraits of deep-sky nebulae like the Horsehead Nebula, even from bright skies in the city. A lot of processing was needed to produce the final version of this photo. The ultra-bright star Alnitak makes processing the image a challenge. The brightness of this star can be easily blown out and take over the image. View the current list of astrophotography equipment used to capture this image. 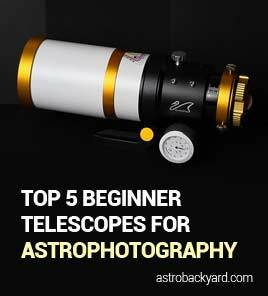 For the latest images and information, follow AstroBackyard on Facebook.